It is almost a direct yes answer. SSL certificates protect the integrity and privacy of your service. If you google a little, you will find you can create your own SSL certificates yourself. However, using a home-made it is not always the best solution. 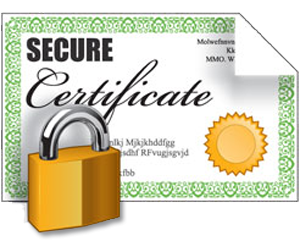 Self-signed home-made certificates offer the same level of protection than a commercial one. The difference is that certificate authorities from commercial certificates are already imported in most of the devices. Which it enables a trust relationship when verifying the certificate. Commercial certificates have some levels of review, therefore when getting a certificate for inside-out.xyz domain, there could be a trust relationship as depending the kind of commercial certificate you were getting, some identity reviews were done. On the other hand, there are multi-domain, wildcard or single FQDN certificates. Multi-domain certificates take advantage of the multi DN capability of SSL certificates and allow you to have for example inside-out.xyz and inside-out.com domains together. Wildcard certificates are those that accept anything on the hostname part of the domain, for example, www.inside-out.xyz and blog.inside-out.xyz will be accepted in the same certificate. I will write about the different options and the implications of using an SSL certificate. I have written before about the different types of FusionPBX clusters. The first one is the one with the load balanced approach, in which it implements the active-active scheme but the fault tolerance relies on the ability of the endpoints to jump to the second best node. The second one is the one with the high availability approach, this is active-passive but the fault tolerance relies on the server end, the endpoints do not realize of any cluster existence. I have also said that each approach does not exclude the other, in other words, you can have a cluster combining the two techniques. I have written before about the load-balanced FusionPBX cluster I offer to the public. Now, I will write about the high availability one. In order try to answer all your possible question, I am writing this article. I hope after a reading you get a clear picture what it is and what it is not a high availability FusonPBX cluster.